Gov. 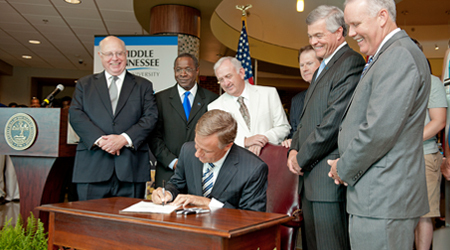 Bill Haslam signed the Tennessee Education Lottery Scholarship Bill June 8 on the MTSU campus, a measure that will allow college students across the state to use lottery-scholarship funds to enroll in summer school next year. The signing took place in MTSU’s new Education Building. Those scholarship funds previously were earmarked for use only during the regular academic year. Under the new law, lottery-scholarship funds will be available for qualified Tennessee recipients who began their post-high-school education in fall 2009 or later and who wish to enroll in summer college courses beginning in 2012. Tennessee Governor Bill Haslam, left, chats with MTSU students Jeremy Poynter, top right, Michael Klassen, Teri Epler, and Ali Brislin during the Governor’s visit to the MTSU campus to sign the bill revising lottery scholarships to include summer school.